ZeroG® Helps Therapy Progress FASTER to Help You Get Better SOONER! 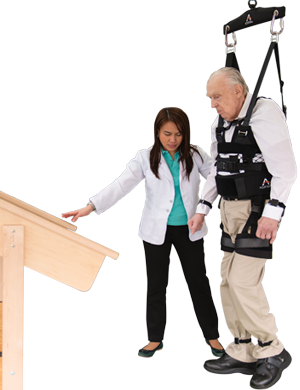 Brookside is thrilled to be the first skilled nursing facility worldwide to acquire ZeroG® with the Woodway treadmill for use in post acute recovery care, rapid rehabilitation and slower prevailing rehabilitation for lower level patients. Our experienced team of physical, occupational and speech therapists provide a multidisciplinary team approach to maximizing the potential for residents with physical, cognitive and communicative disabilities. The use of ZeroG® enhances the potential to regain further independence and functionality earlier on in recovery care and an intervention to allow for persons at low levels of physical and cognitive capabilities. Goal setting, outcome measures, discharge planning and support are a part of the multidisciplinary approach. The ZeroG® Gait and Balance Training System by Aretech helps individuals safely improve balance, gait and functional independence without the risk of falling. ZeroG® is a robotic body-weight support system mounted to a motorized trolley that rides along an overhead track. The advanced fall protection prevents injury by catching an individual if they start to fall. People who may be experiencing weakness and poor coordination can safely use ZeroG® for a variety of real-world activities such as walking, balance exercises and going up and down steps. A therapist secures the individual into a comfortable harness, attaches it to the ZeroG® robot and therapy can begin. The amount of support is individualized for each person depending on their level of ability and can be increased or decreased with the touch of a button. The ZeroG® software includes interactive balance training and games with visual feedback, making therapy fun and engaging while encouraging participation. Focus on improving functional independence, not the fear of falling! Important therapy information from each ZeroG® treatment session is recorded, allowing therapists to monitor recovery. Click here to take a look at one of our case studies. The ZeroG® Anti-Gravity Rehab Equipment at Brookside Healthcare & Rehabilitation Center Providing our rehab patients up to 80% body weight support that reduces the strain and stress, and allows them to execute the movement involved in walking with reduced impact, the ZeroG® is revolutionizing rehabilitation– and allowing our patients to make a swift return home.